As of July 2018, you must apply for a Twitter developer account and be approved before you may create new apps. Once approved, you will be able to create new apps from developer.twitter.com. To help us understand how you use your existing apps, please edit each of your apps and add a description of your app’s use case where it says “Tell us how this app will be used”. We have received higher than expected volumes of applications. Based on these high volumes, we are equipped to respond to all submissions within a few weeks; however, we are also actively working to further reduce this wait time. 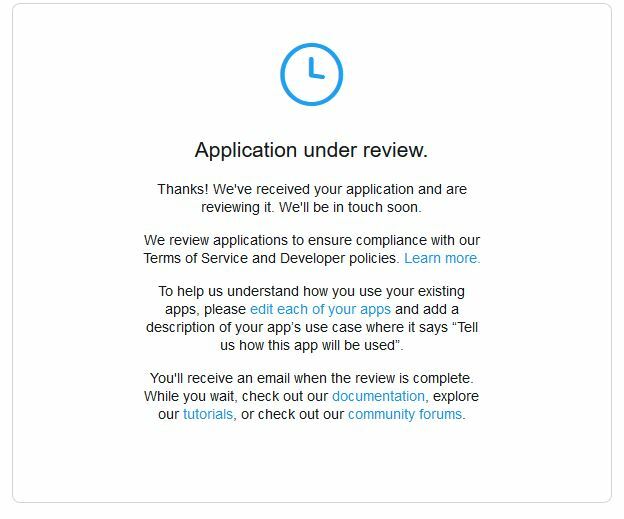 We know that there are many developers who have successfully submitted applications and confirmed their email address, but who have not yet heard a response from our review process. We appreciate your patience. Please continue to look for an email communication from our team within the next few days to weeks.